Maestro Mendi Rodan, Music Director and Chief Conductor of the Israel Symphony Orchestra – Rishon LeZion and “Laureate Conductor” of the Israel Sinfonietta – takes an active part in all facets of Israel’s musical life. Prof. Rodan was also Associate Conductor of the Israel Philharmonic Orchestra (1993-1997), Music Director and Permanent Conductor of the Belgium National Orchestra (1983–1989), Music Director of the IDF Educational Corps Chamber Orchestra. as well as serving as the Head of the Jerusalem Rubin Academy of Music and Dance (1984–1993). Shortly after he immigrated to Israel, Mendi Rodan appeared with the Israel Philharmonic Orchestra in concerts which were so successful that his musical future in his new homeland was assured. 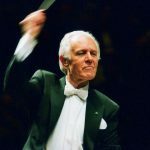 From 1963 to 1972 he served as Chief Conductor and Music Advisor of the Jerusalem Symphony Orchestra, and in 1965 he founded the Jerusalem Chamber Orchestra. Maestro Rodan has also served as Music Consultant for the Jerusalem Music Center “Mishkenot Sha’ananim.” He serves on panels of judges in international competitions – for both composition and conducting. He is a member of the Council of the Higher Education in Israel and Professor of conducting at the Jerusalem Rubin Academy of Music and the Tel Aviv University- Buchman-Mehta school of Music. Mendi Rodan is internationally recognized as a brilliant and inspired conductor, and is frequently invited to guest conduct with leading orchestras in Europe, the Far East, Australia, Republic of China, Mexico and the United States. Soloists of the first rank have appeared under his baton with leading orchestras throughout the world. He has also conducted orchestral recording for several international companies and television stations. The Israeli New Opera production of Viktor Ullman’s “Der Kaiser von Atlantis” and Kurt Weill’s “Die Sieben Todsunden” was conducted by Maestro Rodan – with tremendous success. Recently, Mendi Rodan was awarded the Pelleg Prize,by the Ministry of Education and Culture, as the Musician of the Year” – 1997. In recognition of his artistic achievements, the President of Italy conferred upon Maestro Mendi Rodan the “Medal of Distinction” of the Republic of Italy. He is also an Honorary Citizen of the state of Arizona, U.S.